Back cover blurb: How far would you go to protect your family? Single dad Ben is doing his best to raise his children alone, with the help of his devoted mother Judi. Life isn’t easy, but Judi’s family means everything to her and together, they manage. Then Ben meets Amber. Everyone thinks this is a perfect match for Ben but Judi isn’t sure … there’s just something about Amber that doesn’t add up. Ben can’t see why his mother dislikes his new girlfriend. And Amber doesn’t want Judi anywhere near her new family. Amber just wants Ben and the children. The further Judi delves into Amber’s personal life, the closer she gets to shocking secrets that could change everything. And Judi must make a decision that could lead to the most disastrous consequences. Liar is a compelling psychological thriller with a breathtaking twist that will keep you awake until the early hours. 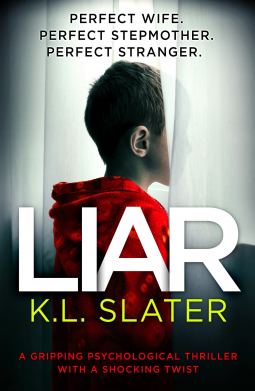 Liar is the latest psychological thriller from K.L. Slater and in my opinion is her best novel yet. It is utterly addictive. Single father Ben is lonely after the tragic early death of his wife. His (somewhat overbearing) Mother, Judi, helps him out with his two young sons and his housework, but Ben feels ready to meet someone new. Amber seems perfect for Ben, a worker at the local children's centre behind the school Ben teaches at, a natural with sons and his Father, in fact the only person who doesn't share Ben's enthusiasm for his new girlfriend is his Mother. Judi is suspicious of Amber, as she has every right to be. After all she is still grieving the loss of her near perfect daughter in law. But Judi's dislike of Amber runs far deeper than the usual mother in law/daughter in law fractious relationship. In fact Judi hates Amber, because she wants to break the bond she has with her son and grandsons but these feelings aren't one, Amber returns then and cannot stand Judi's interfering ways. She vows to marry Ben and get him away from his Mother. But this seems like a cruel thing to do. Is Amber really that cold? Or does she have an ulterior motive for hurting Judi? Liar is a compulsive read, with some brilliant, and some horrible characters (but these might not be who you think!) and a twist that I didn't see coming in s million years. A must read. Liar is available now via Amazon online and all good book shops.